I’m writing about this thing, because I’m having a hard time thinking of what to write about. Threat Quality Press is gearing up, over the next month, to unveil FOUR exciting, new, SECRET PROJECTS, and those things are kind of distracting me. Now, in the first place, a lot of these messages strike me as being really needy. This one in particular is exactly like the way I might casually suggest to an ex-girlfriend that we should get together for a night of liquor and bad decisions, and it’s phrased in exactly the way that never worked. But the thing that drives me nuts about this is that I saw all of these billboards in Suburban Station. Suburban Station, for those of you who don’t know, is in Philadelphia. It is actually UNDER CITY HALL. I am no brilliant marketing scientist or anything, but I think I’ve detected a glaring design flaw here. Are there marketers out there who can shed light on this for me? 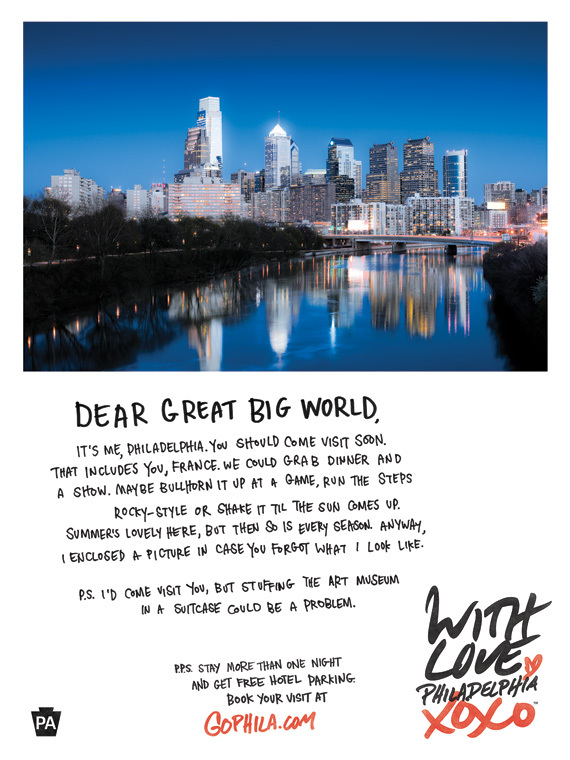 Because it seems to me to be a completely crazy idea to try and advertise Philadelphia’s tourist attractions to the people who are already there. I came across this ad campaign while heading out of Philly, into New Jersey, on our way to New York. Which set my girlfriend and I on a train-ride-long debate over why people should go to Philadelphia, when clearly NYC is the place to be if you want to do a “weekend in the city” vacation. I did not win this one, since “We made cheesesteaks!” and “There’s this vintage shop on South Street I like!” are, no matter how stridently I might push, not game-ending arguments. However, I think we were both on the same page that heading in either direction was a good plan, if the alternative is staying in Trenton, NJ one moment longer than necessary. …you know, that sort of vibe. Plus, “GoPhila” makes me think of “gopher”, which makes me think of “Puxsutawney Phil” (yes, I know he was actually a groundhog but bear with my triggered, target group associations) and that might not translate into the kind of Philly-urban-adventures “GoPhila” is promising. I think we should try reverse psychology. When I see “GoPhila,” I think “Gojira,” or “Godzilla.” And I think we really should make one of those for ourselves. What do you MEAN, “Cloverfield”?! I found out this week that my state set up a store front in Manhattan that cost over $20,000 a month rent to attract tourism to the Jersey Shore. There are residents up in arms about this and the cost of rent to the state. I never see that kind of money in a years salary ever.